FreeAgent is extremely simple and easy to use. I have tested several other accounting software websites such as QuickBooks, Sage and Xero, but Freeagent wins my vote. With most other online accounting software I have tried, I’ve experienced several bugs and issues. One of the main issues I experienced with every other website, was automatic importing of PayPal transactions being incorrect due to USD transactions being converted to GBP, which the software did not take account for. Meanwhile, Freeagent deals with this perfectly and allows me to integrate the software with PayPal and Bank swiftly without any hassle. FreeAgent saves me hours of time that would normally be spent managing my accounts and transactions. No more fiddling with spreadsheets and paperwork! You can also create a new account for your accountant to access your accounts at the same time as you (for free). As well as the amazing software and features, FreeAgent also has an amazing customer support team. FreeAgent has been rated the best accounting software for small businesses in the TrustRadius Buyer’s Guide to Accounting Software! 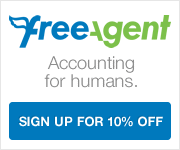 Start your free 30 day trial at FreeAgent today and get 10% off future renewals! Use discount Referral Code ’45weycer’, or click here.